This instrument is the predecessor of the modern orchestral flute. It plays two and a half octaves. For beginners we suggest starting on a four hole pentatonic (five note scale) to learn first as it will make learning the six hole diatonic scale transverse much easier"
Flutes in the lower register are meditative and soothing. 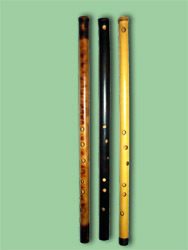 The term "Pentatonic" denotes that this flute is based on a five note scale. This flute is the predecessor of the Native American 'Love Flute'. 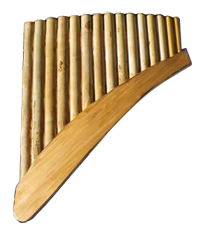 A member of the block flute family, this instrument is available in Mode 1 F# Pentatonic. 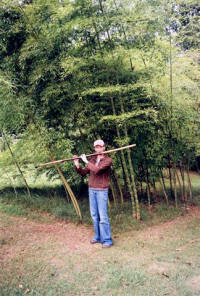 The term "Shakuhachi" in Japanese means 1.8 feet. This flute is end-blown and has proven to be difficult (though not impossible) for most people to master. Its haunting, mysterious tones have lured many to play this challenging instrument. Available in the traditional key of "D" Pentatonic Mode 1. The panpipe (vertical flute) is one of the most ancient of the bamboo flutes. It is found in many traditional cultures, including Greek, Middle - Eastern, and Andean in South America. 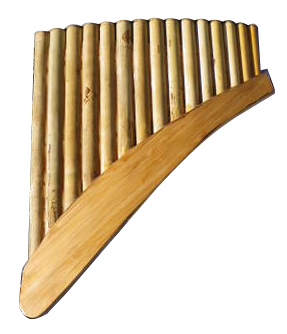 The panpipe is a series of bamboo tubes tied together in ascending order of size. The longer the tube, the lower the pitch. Available in 1 to 2 octaves in these keys: C, C#, G, and others upon request. Available in both Major and Minor scales. This combination walking staff/transverse alto flute is 5' in length or more- it's an excellent companion for long hikes! (Click photo to hear flute) Smoky Mountain Stream or "Ancient Palenque"
If you would like to hear a particular flute before purchasing, call Greg and he will play it for you on the phone. Download and print playing instructions by Greg.